How to get there: Ely, a small town on Hwy. US-50, is a good point of reference. Travel north from Ely on Hwy. US-93, about 17 miles. You should identify a signed side road going right, called Duck Creek Road. There is also a sign for Gallagher Gap. Travel along this road for 8.5 miles, then locate a road going left. 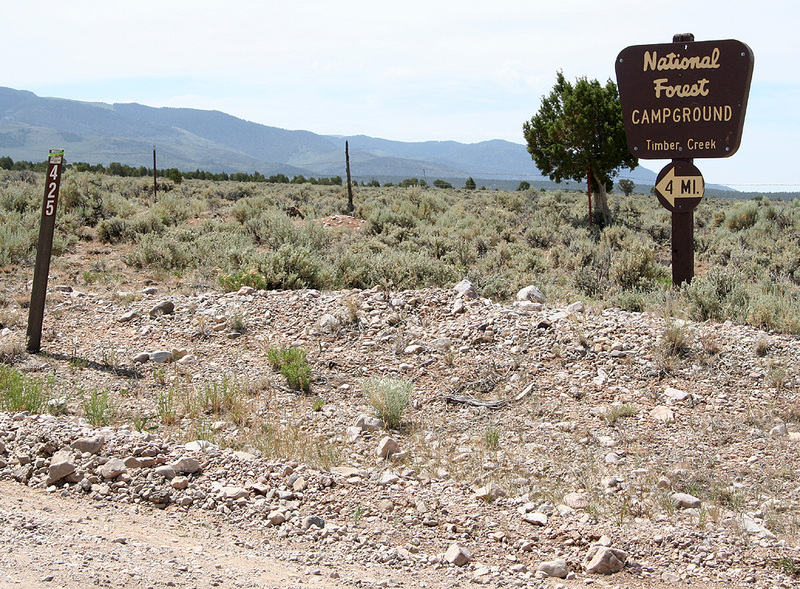 This road is identified as Forest Road 425, Timber Creek Campground, on a sign near the turnoff. Driving from US-93, you cross one cattleguard, then Forest Road 425 is left immediately before the second cattle guard. This road is dirt until you reach the campground after 4.4 miles. Ordinary cars should be able to get there with some care. A 4WD may continue across a cattle guard and about 0.6 more miles higher up in the valley. This is about 50 meter from the road closure. The total distance along Forest Road 425 is then 5 miles. This is the trailhead, location N39:23.967, W114:36.966, elevaion 2772 meter. 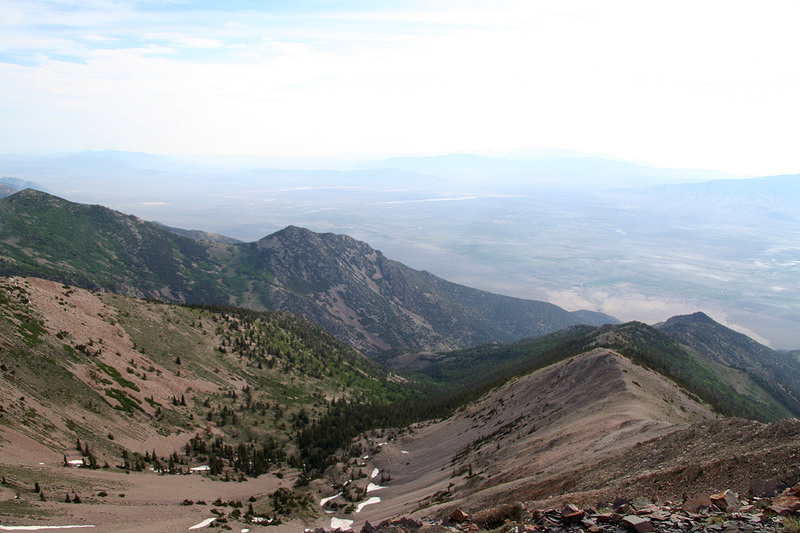 Route description: From the trailhead, continue up along the jeep road that has been closed to motor vehicles above this point. 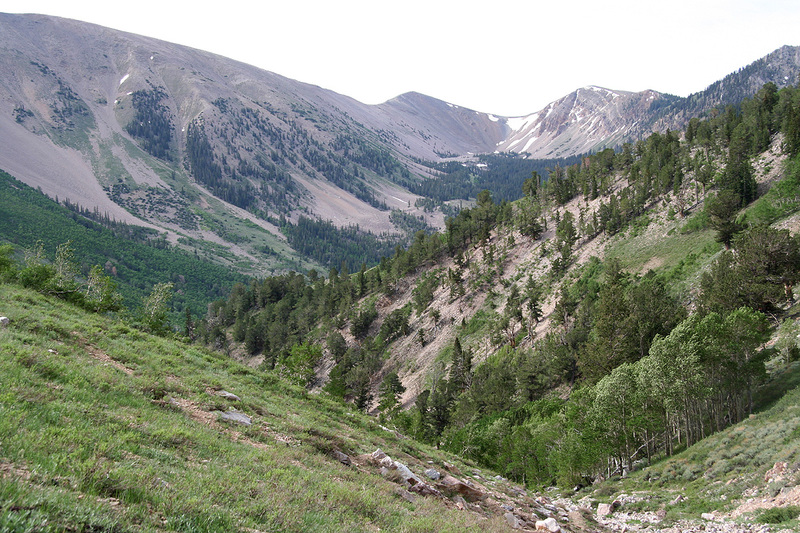 Pretty soon, the valley forks, the route follows the left fork. Here, the jeep road ends, but a nice trail continues up this little valley. The valley gradually bends right and finally ends in a small bowl. There may be a narrow snow field here even late in July. The trail ends here, but the terrain is absolutely (YDS) class 1. The most direct route to the summit now ascends the broad ridge that forms the right side of this bowl (when facing uphill). Alternatively, one can make a somewhat longer loop and ascend directly to the lowest saddle on the main ridge, this is up on the left side of the bowl. Either way, ascending gentle slopes you will arrive at the main crest and the small, but distinct summit ridge will come into view. The final stretch is short and very easy, here again one may follow a small summit trail. Comments: After an extraordinary nice climb of Mount Moriah, I drove back to Hwy. 50, then onwards to the small town of Ely. After a brief stop, I continued to the trailhead of Timber Creek. Many people had converged having small groups making barbeque dinners in preparation for the July 4th. celebration the next day. I continued driving uphill on a somewhat rougher road until the very top. Pulling over to park, I noticed a camper that was parked fairly nearby. I decided to walk over and ask if it was OK to be where I was, I did not want to intrude on anybody by parking too close. A middle aged couple greeted me welcome, parking was no problem as long as I did not intend to create a lot of noise. They wanted a quiet, peaceful 4th of July weekend. I was asked to stay, and the man offered first one, later a second can of beer. We had an interesting conversation where the topics came and went across a wide scale. Eventually, I thanked them for great hospitality and went to sleep in my car. The next morning, I started out at 0630 and had a nice walk up the valley along a good trail. Higher up, I decided to gain the main divide despite this being a slight detour. Hiking was nice and easy and I reached the summit by 0825. leaving at 0840, I had a leisurely return using the long snow field to my full advantage, then returning by 0855. I said goodbye to the couple in the camper and began my drive towards Los Angeles (via Las Vegas). 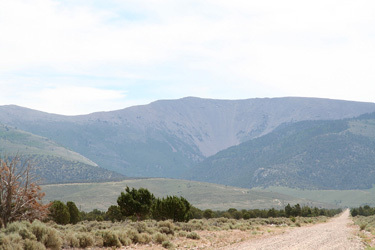 North Schell Peak, as seen from Duck Creek Road. 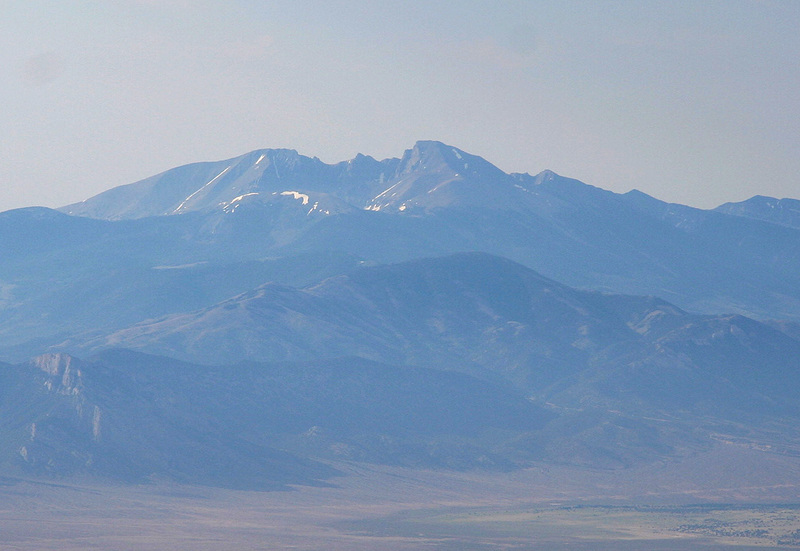 Wheeler Peak, as seen from North Schell Peak. 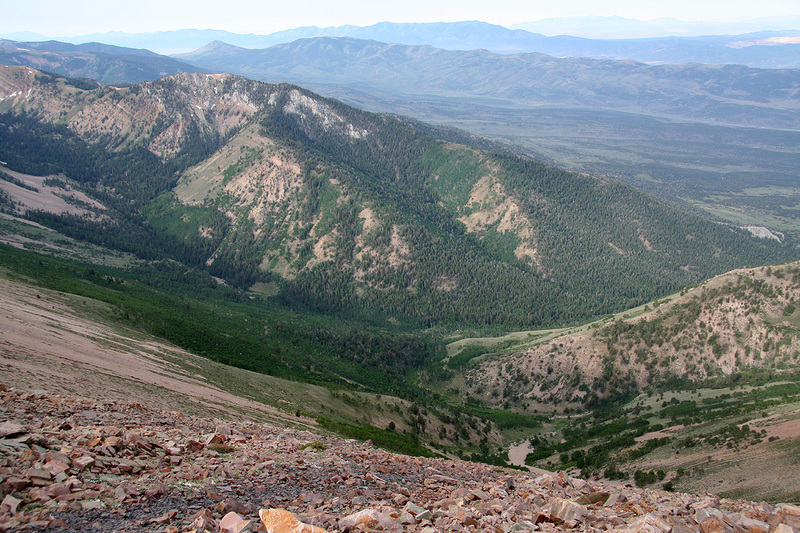 Timber Creek Valley, as seen from the summit.